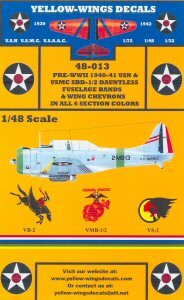 Yellow-Wings Decals has released another colorful utility decal sheet, this time for the Accurate Miniatures or Hasegawa 1/48 SBD-1 and SBD-2 kits. 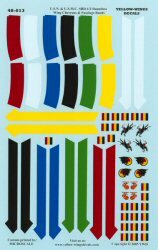 This sheet provides the fuselage bands and wing chevrons for all six sections of any selected squadron. In addition, this set also provides the squadron markings for Bombing Two (VB-2), Scouting Two (VS-2), Marine Bombing One (VMB-1) and Marine Bombing Two (VMB-2). The sheet also includes a nice set of pre-war propeller tip warning stripes. 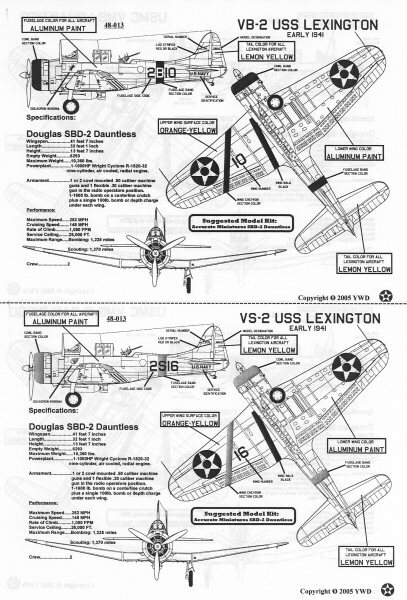 The set also includes several profiles and documentation to help you replicate the proper placement of aircraft's markings to render an accurate model. Yellow-Wings Decals can be purchased directly from their website at www.yellow-wingsdecals.com. 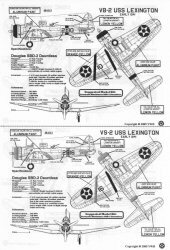 My sincere thanks to Yellow-Wings Decals for this review sample!